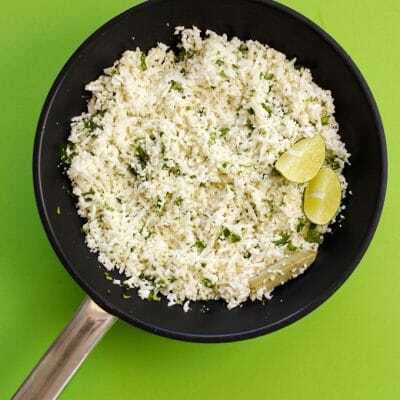 Rice: Grate cauliflower into “rice” using either a box grater or the grating attachment of your food processor. Cook: Heat oil in a large skillet over medium. Add cauliflower and bay leaves. Cover and cook for 5 minutes, or until the rice becomes slightly tender. Mix: Mix in chopped cilantro, lime juice, and salt. Recipe from Live Eat Learn at https://www.liveeatlearn.com/chipotle-copycat-cauliflower-rice/.